The first big news post-merger of two big direct-to-home (DTH) operators (Dish TV&Videocon d2h), is a possible launch of over the top (OTT) service. The new initiative is aimed at allowing the subscribers of the two DTH brands to access content on the go. Rs 2200 crore has been paid as levies, taxes and licence fee by the direct to home (DTH) service provider Tata Sky for FY2018. The licence fee stands at Rs. 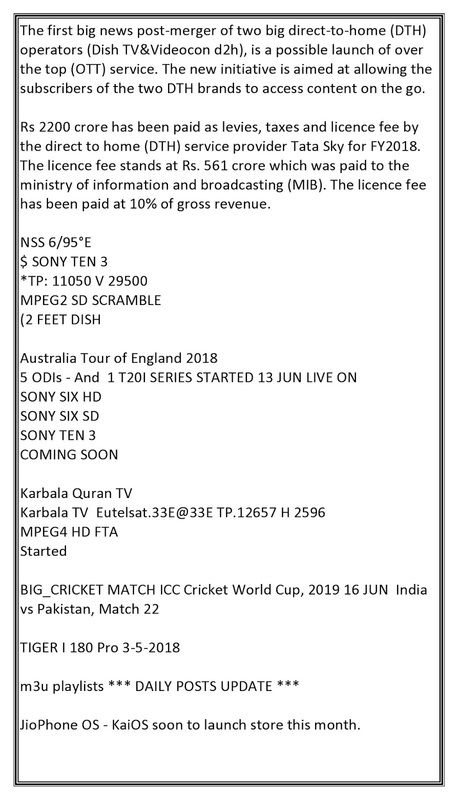 561 crore which was paid to the ministry of information and broadcasting (MIB). The licence fee has been paid at 10% of gross revenue. JioPhone OS - KaiOS soon to launch store this month.